The fastest-growing, most dynamic capitalist country in the history of the world is the People’s Republic of China today. PETER HESSLER has lived in China for the last ten years as a staff writer for The New Yorker; he spent months in a development zone, hanging around with businessmen and with workers. Peter’s new book is COUNTRY DRIVING: A Journey Through China from Farm to Factory. Plus: HAROLD MEYERSON says “Like earthquakes, Goldman Sachs can strike anytime. Its work can slumber undetected for years, only to erupt, unanticipated, with catastrophic consequences.” He looks at how Wall Street greed and secrecy are bringing misery to Greece and endangering the European Union. Harold writes an op-ed column for the Washington Post. Also: The past and future of capitalism: historian JOYCE APPLEBY says capitalism isn’t an expression of human nature, but the specific result of some unlikely developments, mostly in England. She emphasizes that capitalism is as much a cultural as an economic system. 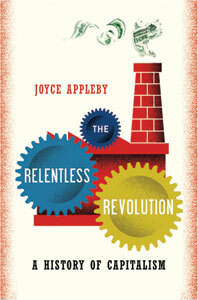 Joyce’s new book is THE RELENTLESS REVOLUTION: A History of Capitalism.